Need more than 239TB in a single convenient storage box? Need a cloud on wheels to utilize that storage? If so, AIC has the toys for you. 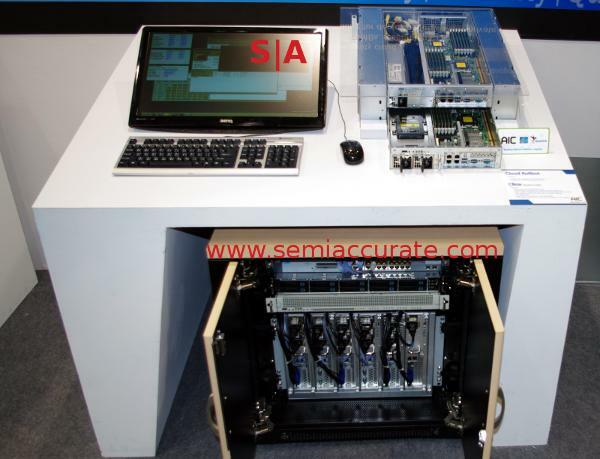 It has been a while since we last wrote about AIC, but they were the first company we saw to show off the concept of vertical HDs in a rack mounted storage solution. Back then, boxes with massive drive counts needed to have a server built in, SCSI was too limiting to allow for a NAS-like device. Luckily, SAS changed all of that, and AIC now has what amounts to a 240TB capable external drive bay. Unfortunately, it is not USB3 capable, but we can hope. Actually, since this is SAS, not SATA, the cabling is not all that bad, each cable can pass multiple streams of 6Gbps data, so the giant killer squids that roamed storage apparatuses in days of yore are well and truly slain. It was mere coincidence that you could buy some of their cousins two rows back at the Computex Nangang 4F food stand, but we opted for the ‘pizza’ anyway. In any case, one of these, four SAS cables, and 60 HGST 4TB drives, and you can start consolidating all those CDs you burned over the last few decades in one convenient box. 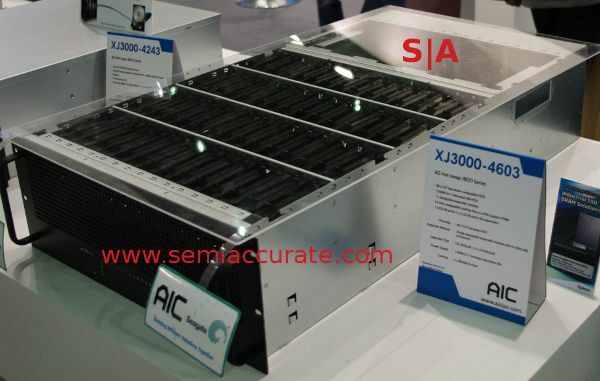 The second part of AIC’s Computex offerings was dubbed the ‘Cloud Rollbot’. Unfortunately, it didn’t turn in to a boom box, giant robot, or even a flying aircraft carrier, it was just six 2S servers and a lot of accessories in a wheeled box. The Rollbot has 12U of rack space, and has a novel 3U high server chassis cage to go with it. It does have a battery, but don’t expect it to last very long, think UPS times, not trans-Pacific flights.